There are some weeks when I am sure that my brain is going to cave inwards. This was one of those weeks. It wasn’t any one thing in particular that made me lose my sanity temporarily – rather, just a ton of little tasks that couldn’t be contained by to-do lists. A sure sign that I’m spent physically and mentally is when I proclaim that lying in a pit of earthworms seems more appealing than cooking dinner. Dramatic, I know. That attitude inevitably translates to lazy meals. Pizza one night, eggs on another. I finally mustered the wherewithal to pull together this one-pot chicken recipe, which fits the bill when you want to minimize clean-up responsibilities. Seriously, I was pathetic this week! Ever since I made Quinoa with Caramelized Crimini Mushrooms, Soy Sauce and Ginger years ago, I knew that my favorite grain was a perfect match for my favorite vegetable. So, why not nestle some seasoned chicken thighs into the simmering mixture, along with some fresh spinach for a complete meal? Dinner on the table, massive clean-up averted and laziness rewarded. Place the chicken thighs in a medium bowl. Add the rosemary, smoked paprika, salt and pepper, and toss to coat the chicken. Heat 1 teaspoon of olive oil in large nonstick skillet set over medium-high heat. Add the chicken and cook for 2 minutes on each side. Transfer the chicken to a plate. Heat the remaining 1 teaspoon of olive oil in the skillet. Add the onion and mushrooms, and cook until the vegetables are tender, 4 to 5 minutes. Stir the quinoa and broth into the vegetables. Bring to a boil, then cover, reduce heat and simmer for 15 minutes. Nestle the chicken into the quinoa, and cook (covered) until the liquid is absorbed and the chicken is cooked through, about 15 minutes (total of 30 minutes). Transfer the chicken to a plate. Stir the spinach into the quinoa. Serve with the chicken. Season to taste. This is TOTALLY my kinda dinner! One pot meals are always a hit and I love all things quinoa! The mushrooms are perfect for the fall weather so I gotta say it: Winner winner chicken dinner! Pinned! I love quinoa and this sounds wonderful! This is right up my alley! All of your recipes are always good and since we’ll be on vacation (I still cook) this will be perfect. I never know what kind of utensils will be in the kitchen so I’m taking my skillet. Thank you for sharing. What a great one-pot dish! I’m always looking for easy and yummy recipes, and this recipe looks like it fits the bill. I can’t wait to give this dish a try! That is a fabulous one pot meal, my friend. What a great weeknight dinner. Always looking for great healty one pot dinners for my menu plan! This looks like a perfect meal to me. I love one-pot dinners they make weeknights so much easier. Yeah for one pot dinners that make mom life that much simpler! I heart you! 🙂 I love mushrooms and quinoa so you can bet this recipe will be on our dinner table sometime in the near future! I love how quick and easy this is – perfect for a weeknight family dinner! I love that there is so much goodness in this one-pot meal! It looks rich, hearty, healthy, and deeelicious. Oh my goodness, this is calling my name. I love chicken, I love quinoa, and I LOVE mushrooms. YUM!!! This looks and sounds delicious. And easy, always a plus! A lot of my favorite ingredients are in this recipe: spinach, quinoa, mushrooms, and of course chicken! Oh yum! This looks seriously delicious! Adding this to my must-make soon list. Your description of earth worms reminds me of those “would you rather” questions that make my stomach turn. 🙂 But I totally feel the same way about making dinner, this chicken dish looks fantastic! I love all the mushrooms, such a great fall dish. The cook on the chicken is gorgeous! What a simple & flavorful one pot meal! Dara! I wish we were having this for dinner! This looks so good! Like you have no idea how much I want this! Made this for dinner, and it was great! Our one issue with it was that the chicken didn’t cook all the way through by the time the quinoa was done, so I just pan fried it separately for a few minutes on each side to finish the cooking process. Still delicious! So, I just made this again tonight to re-check everything and it took the chicken 15 minutes to cook through (not including the browning time of 2 minutes per side). I apologize for the confusion, but I’m glad you enjoyed the flavors! I just made this for dinner. Same experience with Stephanie. Chicken still raw. I even put them in with the quinoa early. I would say 20 minutes simmering with the quinoa (recipe say 10 minutes) and still not cooked. I am going to put them in the oven to finish cooking. Quinoa does have a good flavor though. Bonfei, please see my response to Stephanie above. When I first made this (I tested it a couple of times), I cooked the chicken for 20 minutes and it turned out dry. I think 15 minutes should be just right (not including the 2 min per side of browning time). The recipe has now been adjusted. Thanks for weighing in! I ended up putting the chicken in the oven for 10 minutes and they came out nicely. I did enjoy the dish even with the extra step 🙂 Keep those recipes coming. Hello! To clarify per the instructions, you bring the quinoa to a boil, reduce heat, cover and simmer for 15 mins. Then you add the chicken thighs, uncovered and cook for another 15 mins until liquid is absorbed? So a total of 30 mins? 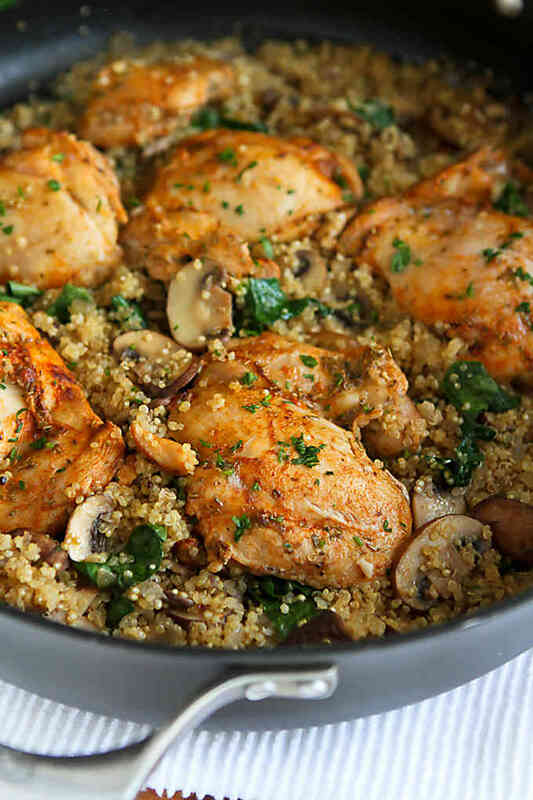 Chicken, quinoa, and mushrooms is the perfect combination! Especially when it’s all made in one pot. I’m literally obsessed with one pot wonders these days. 🙂 Thanks for linking to our chicken and rice soup! This was SO yummy! Cut the ingredient sizes in half to serve two, and used cut up chicken breasts instead of thighs. Still turned out delicious. Thanks! I too am confused with cookng time and when it should be covered and when it shouldn’t. Do I put in the quinoa and cover for 15 minutes then remove cover and cook with chicken for another 15 minutes? Thanks! I edited the recipe to make it a little more clear. Please let me know if you have additional questions. This had amazing flavor, but cooking the quinoa for 30 minutes total turned it into goo. Did I do something wrong? Next time will leave time at 15 mins. 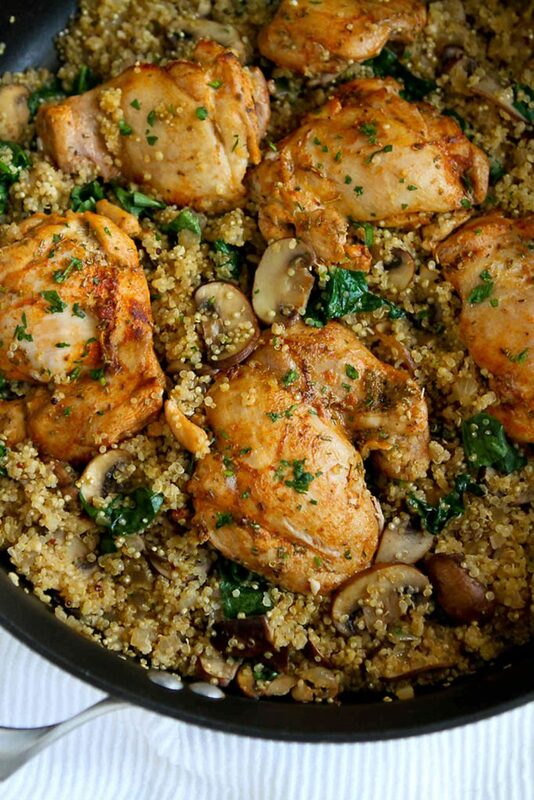 Just made your One-Pot Chicken, Quinoa, Mushrooms & Spinach dish. Yum! Thank you for sharing this with us, Dara. The only changes I made was to use chicken breast which I velveted first to give the meat a melt-in-your moth texture. I sautéed the veggies first, then added the (velveted and still raw) chicken in smaller (almost) bite-size pieces then continued on with your recipe (except I used frozen spinach which I added the last 10 minutes while the quinoa was still cooking. Thank you for a delicious and healthy recipe. The whole family enjoyed this. 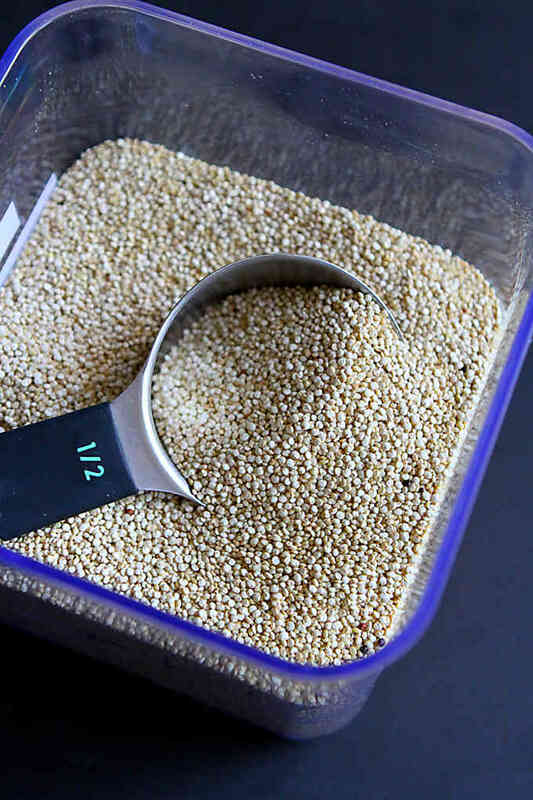 Okay, so I’ve never had quinoa, but in an effort to be healthier, I cam across this recipe and thought why not try it? I just made this tonight and just finished eating it and WOW! It was soooooo tasty and a huge hit! I cannot wait to make this again. Everything from the veggies and quinoa to the chicken was just delicious. Thanks for sharing this stellar recipe! I made this last night – followed the recipe exactly as provided and it turned out wonderfully! So so so good! Definitely adding it to the rotation. Thank you! I’m going to try this tonight. But I have no quinoa, so I will use rice. I bought chicken thighs, spinach and mushrooms this morning. Then I looked for a recipe. I must have been in sync with the kitchen gods. This was the perfect combination of yummy and easy. I ended up using chicken breast since that’s what I had in the freezer and added lemon juice from half a lemon. Definitely a make again! Made this recipe tonight and it was delicious! I doubled the mushrooms and onions because we love both. And I garnished with chopped scallions. It was a big hit!! Will definitely make this one again!! This was a very good receipt. Made it but added a little white wine for flavor with the chicken broth. 4.8 starts.. Very good. White wine would add a great layer of flavor. Good suggestion! how do you convert the cooking time when using a crockpot? Hi Kimberly, I haven’t tested this recipe in the crockpot, so I’m hesitant to give specific instructions. Made this and LOVED it! I coated the chicken with oregano, rosemary and basil. I used green beans instead of spinach and added some fresh garlic to the vegetable mixture. It was so flavorful! I’m so glad to hear that you enjoyed it! The green beans sounds like a great option. Hello – we are not fans of mushrooms – can you recommend another vegetable to use? Also, I have some quinoia from another recipe just chilling in my fridge – can I add that to the recipe and not cook up another batch? Thanks so much for your thoughts. 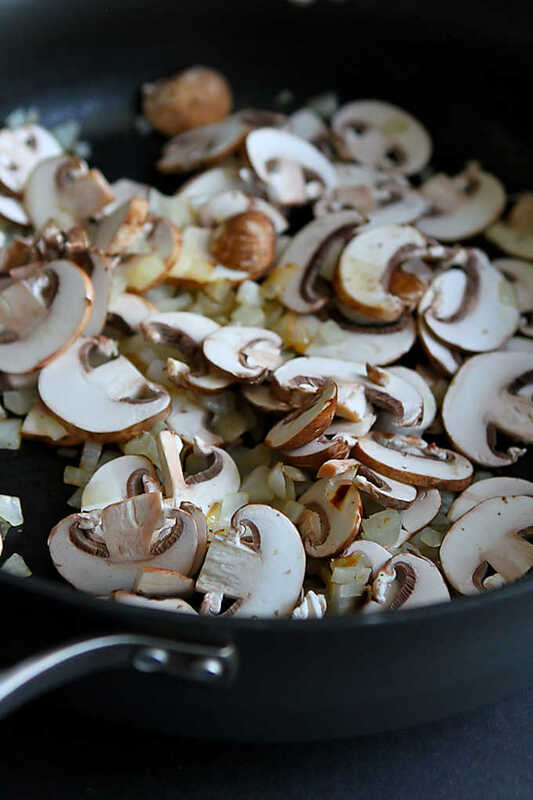 Hi Paty, you could substitute several veggies for the mushrooms, such as peppers, butternut squash or roasted tomatoes. Of course, the flavor will change a bit, but should still be good. Oh my Goodness!! I just finished making this and I rate it!! Taste is out of the park good!! Must try!! Was really struggling with this recipe…..Quinoa normally takes about 10 min to cook with double the amount of water. After 15 min simmering acc. your recipe I was supposed to add the chicken. By that time the water was completly absorbed! So >I had to make extra bouillon to add. ……and then 15 min for the chicken is not enough to be fully cooked! Really, I don’t know what I did wrong? I finally tried this recipe over the weekend (it’s been on my list for ages). A total winner! We made the recipe as printed, no adjustments and it turned out so well. Lots of flavor and really easy. Stumbled upon this recipe last night. I normally make recipes as they are but I had to make a few swaps due to what I had on hand and a distaste for shrooms. Used diced carrots, red onion, and a small package of frozen spinach. Really awesome and obviously versatile recipe. Love anything that’s this easy, nutritious, and quick clean up! Leftovers are awesome. as well:)Will be adding this into rotation. DeLICIOUS! I made a few substitutions (cut up breasts instead of thighs, used Rosemary Essential Oil instead of herb, used more mushrooms and onions than it called for, and used kale instead of spinach as I had kale on hand), but it was still delicious! This is a winner and one we could eat regularly! I love chicken and mushrooms, but I seldom use them together for a recipe. Let me do this, thanks. This is the second skillet recipe I tried. I rarely cook, because I hate cooking and I create such a mess. When I found skillet dinners I was so excited. My husband and I have tried to each healthy, but it was too difficult and a mile long of ingredients. The dish was so delicious and so easy to prepare. My grandson asked if I was going to start cooking more. YES! YES YES! My family loves this recipe! I used chicken thighs, like the recipe states, and cooked them for maybe 3 or 4 minutes longer than stated, but my stovetop gets hot really easily. Thank you for such a great recipe. The flavor of this was awesome. It was easy and even great as leftovers. I would recommend to anyone. This is very yummy! I made it with boneless skinless chicken breasts instead of thighs. I cooked the chicken in my Air Fryer then added it to the quinoa. Delish! Everyone loved it!! Made this for dinner last night. It was delicious! Definitely making it again. Thank you! This is an amazing dish. THANK YOU! How can it be covered for an instanpot ? Hi Cindy, I actually haven’t tried making it in the Instant Pot. If I do, I’ll be sure to update the post! That’s great to hear, Kim! And great idea to sub in kale. This is the new dish my family craves! I modified it for our personal tastes, but mostly just followed directions. It feels like a special occasion meal, yet it is easy to make and I feel satisfied knowing my family is also ENJOYING a healthy meal! That’s so great to hear, Lora! I’m so glad that your family loves it so much. Delicious!!! I dod adjust the chicken cook time a little. I browned for 4 minutes per side and added it to the pan after 10 minite so it cooked in the pan for 20 minutes. Ot came out perfect! My whole family loves this, and it was so easy.